Aasheesh Kolli wins Outstanding Dissertation award at ISCA! ACM (SIGARCH) and IEEE (TCCA) have awarded Aasheesh the inaugural Outstanding Dissertation Award in computer architecture. Keeping above "PAR", Vijay Chidambaram and team win Best Paper Award @ FAST'18, 2nd year in a row! "Black-box Concurrent Data Structures for NUMA Architectures" has been bestowed the significant honor of 2017 SIGPLAN Research Highlight Paper. We are in The Morning Paper (once again)! VMware Researcher Leonid Ryzhyk and friends wrote a HotOS '17 paper titled "System Programming in Rust: Beyond Safety". The Morning Paper has a follow up to Corfu, vCorfu by our talented VRG family. Did you see the Morning Paper today? Corfu: A distributed shared log is up, authored by some former and current VRG members! ASPLOS '17 Best Paper Award goes to Irina Calciu and Marcos Aguilera! Congratulations Irina, Marcos, Sid and Mahesh! "Stochastic program optimization" by Eric Schkufza is in the Morning Paper for March '17! What's this? Another VRG paper on The Morning Paper! Spring 2017 is off to a good start. 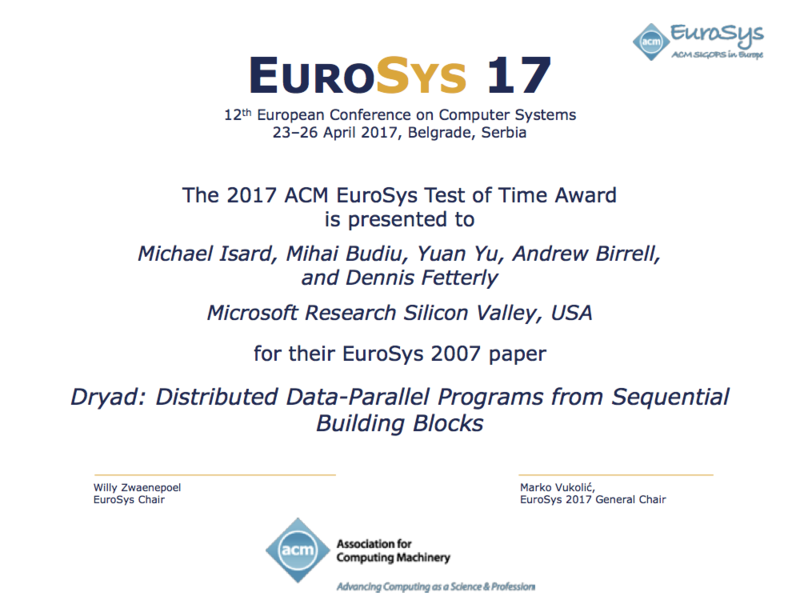 Best Paper Award at FAST 2017 goes to “Application Crash Consistency and Performance with CCFS” by Vijay Chidambaram! "Agile Paging: Exceeding the Best of Nested and Shadow Paging” by Jayneel Gandhi, has been accepted as an IEEE Micro Top Pick of the year 2016! Great start, 2017: Another VRG paper on 'The Morning Paper'! The Many Faces of Consensus, posted on The Morning Paper, January 2017. Two recent VRG works on 'The Morning Paper', fall 2016! Did you know that majority agreement isn’t required by Paxos?